These sound a little weird from the get-go, but they are worth it. Essentially, it's like a little quiche inside a pepper. They're colorful, and delicious, but actually pretty filling. If you don't like peppers, they're probably not for you, but other than those weirdos in my family, I think this was a crowd pleaser. Remove the top 1/2-inch of each pepper and discard the tops/seeds. Arrange the peppers, cut side up in an 8x8 baking dish. 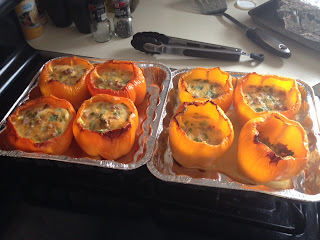 (If the peppers don't stand up, you can slice a little off the bottom to make it flat- but make sure not to puncture the pepper at the bottom or the filling won't stay in! --yes I made this mistake...) Fill the bottom of each pepper evenly with hash browns and meat. In a large bowl, combine eggs, cheese, milk, Bisquick, sour cream, green onion, salt and pepper and whisk until combined. Pour mixture evenly into peppers and bake appx 1 hour. (Recipe says 45 minutes but it's not long enough for a toothpick to come out clean).